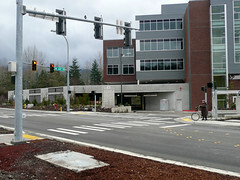 The newest street in Issaquah at the moment. Built in 2011, this street gave a much-needed additional vehicle crossing of the I-90 corridor with the added benefit of being the only one we have which doesn’t also have to deal with freeway-bound traffic. The city plans to extend this street north along what is now 221st Pl SE all the way to SE 56th St. This would also connect to another new road being proposed which would extend SE 62nd St across the wetlands and Issaquah Creek into the south end of the Pickering Place development. Map. Length: 2020 feet. There’s a second approximately 1000 foot segment along the old Zetec access road which has been restricted to one-way northbound with parking along one side. Car lanes: 2 plus turn lanes. Signage: Four-way signal at Gilman and post office entrance. Pedestrian signal at SE 64th Pl. Three-way signal at SE 62nd St.
Sidewalks: 64%. Permeable cement except at intersections. Full length on the west edge. 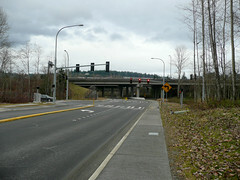 From Gilman to just under the freeway on the east edge where it connects to the East Lake Sammamish Trail (ELST) which runs parallel and adjacent to the north portion of the street. At the time of this writing, the ELST is still gravel. Also the west edge sidewalk is closed to pedestrian traffic by signage north of the Pickering Trail since there is currently nowhere for pedestrians to go at the intersection with SE 62nd St.
Bike lanes: No. I suspect that the thinking was that cyclists would use the ELST once it is paved. Currently most cyclists seem to ride on the street despite the lack of any significant shoulder for most of the length of the street. It will be interesting to see if this changes once the ELST is paved. Bus stops: No. Nearest: Gilman Blvd access to the 200, 209, 214 (commute), 271 (after hours). Black Nugget access to 269, 927. 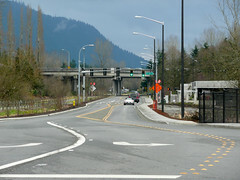 Bike/ped-only connections: East Lake Sammamish Trail parallels the street and intersects with the Pickering Trail with pedestrian access to Pickering Place and the Issaquah Farmers’ Market at the Pickering Barn. 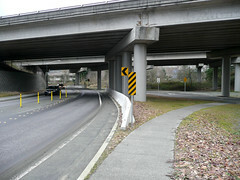 ELST also intersects with the Preston Trail below the freeway. The south end of the street gives access to the Gilman Blvd edible landscaping trail. East of the street north of the freeway there is pedestrian access to the parking lot of the Meadow Creek office complex. Green: Quite a bit though most is zoned for development. The triangular lot between Gilman, ELST, and 4th Ave is largely wooded behind Gilman Station. 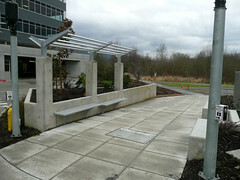 North of the freeway, to the east is green space behind the old used car lot on East Lake Sammamish Parkway. To the west is restored wetland adjacent to Issaquah Creek. The north end bridges the North fork of Issaquah Creek. Zoning: “Retail” south of freeway. “Commercial” for new medical office building on old Zetec property and Meadow Creek. “Community Facilities-Recreation” for the Pickering trail corridor. “Retail” for the portion north of Meadow Creek. Potential improvements: As a new street it is in good repair. It’s unfortunate that bike lanes were not included in the design. Formalized pedestrian connections to the Meadow Creek complex parking lot would be well-used. Connections to the ELST should be reviewed after it is paved. These are great posts Jeff. Thanks! I am one of the bikers who uses the street instead of ELST. 4th Ave NE shortened my bike commute as well as car commute. I am curious if anyone knows when ELST will be paved? According to the ELST Project Page, the call for bids for paving the Issaquah section of the trail opened on February 21st. It looks like they have all the necessary permits in hand, so we can probably look for the project to start as soon as the weather starts to cooperate. Should make for an interesting summer!